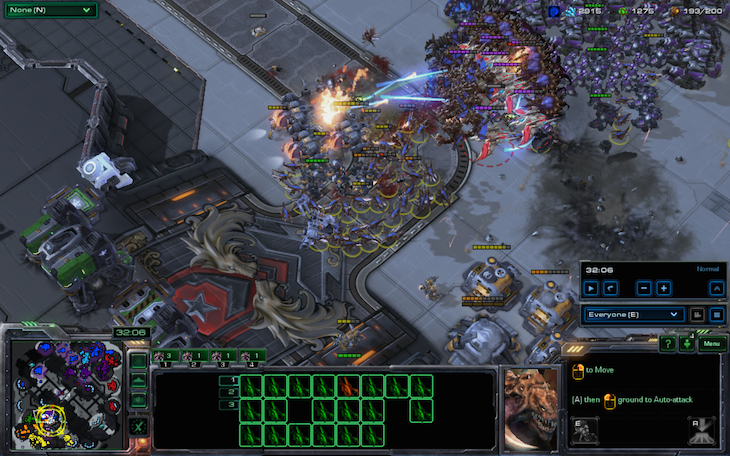 My family, when not distracted by LoL, work, school, school work, random online games, more school, and social interactions, does enjoy playing a little SC2 now and then, for fun. Of course, these fun interactions quickly turn sour when I vent after a loss or when I'm losing, inevitably leading to us doing something else. This basically confirms that I'm killing eSports. We can't have a "them versus me" match (where I would be a pretty good sport if I lost) because I can defeat nearly my entire family 1v3 or 1v4. This means that I have to be on their team and be very patient, a task that is nearly impossible when I'm carrying the team. 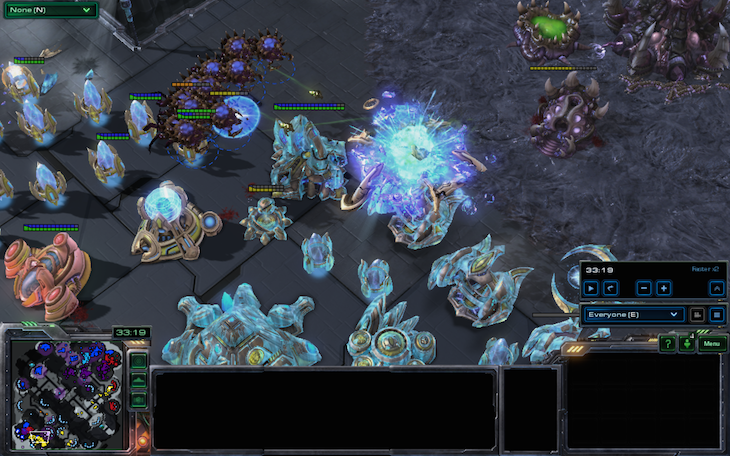 Vetharest: Silver league 1v1 (Roughly a 2-10 record across two seasons, so take it with a grain of salt). 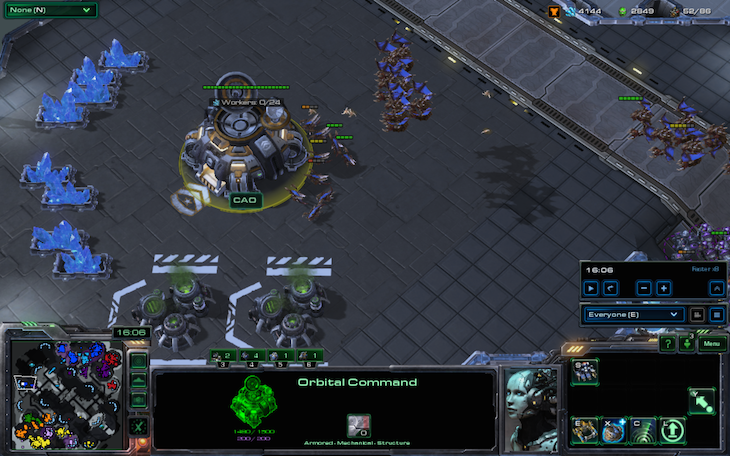 Likes to make blink stalkers, oracles, and DTs if possible, but will actually pick a reasonable unit composition most of the time when he needs to. Dog: Unranked 1v1. Probably a little better than Vetharest. 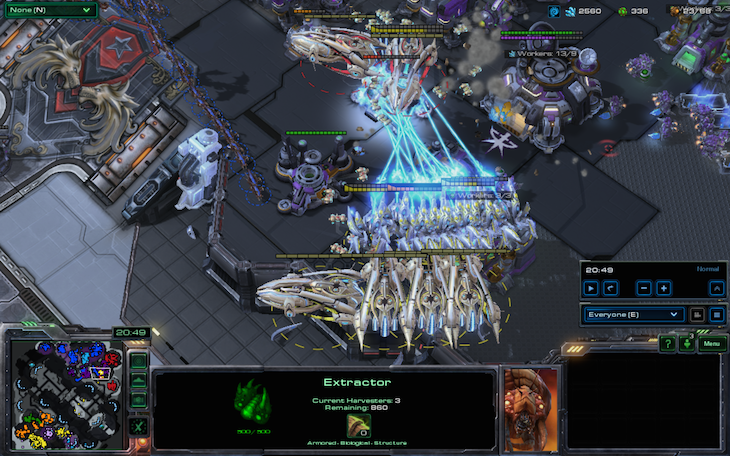 Likes to upgrade his units early (to the point of a 4 minute double engineering bay off one base). 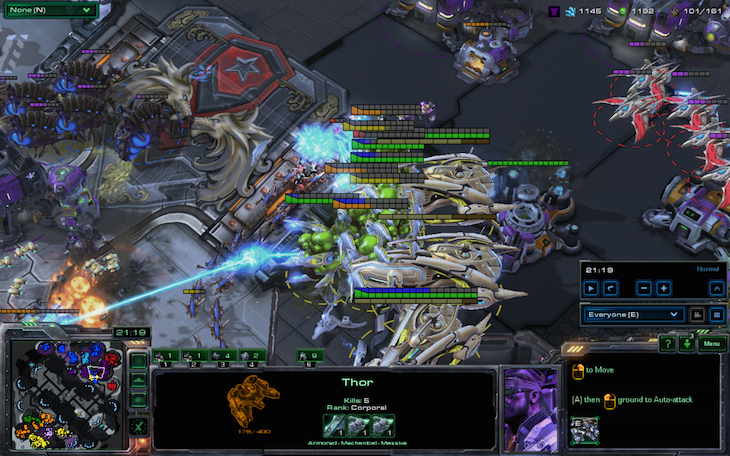 Typical late-game composition generally consists of thors + some bio, but can mix it up a little bit. Additionally, most games are either me besting the other team in a 2v4 (usually one of Dog and Vetharest step it up and play well), or us getting picked off one by one. When we play, the games are not usually close and rarely entertaining. Honestly, most of the time, I think they do more harm than good to our family, but maybe one day we'll all be the same skill level and can enjoy the games like normal people (Or I can stop venting when I lose). Occasionally, we get games that are talked about for weeks to come due to the amazing quality and/or teamwork we used, even if we lost. Today Last week, we played two of those games in a row. 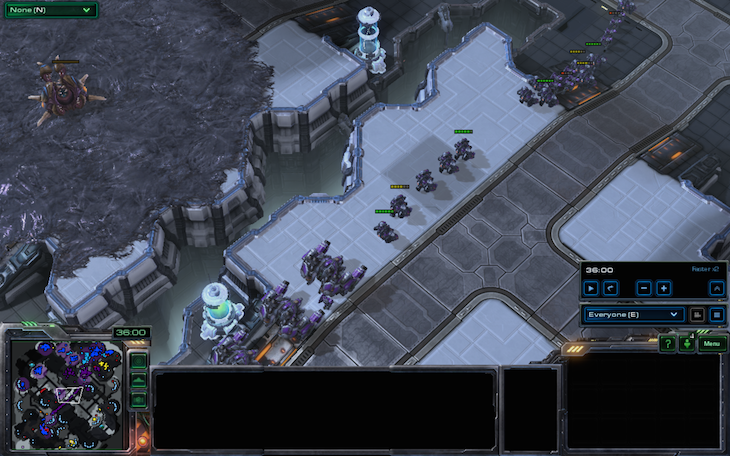 Yes, two games, as the same races, on the same map, in almost the same spawn positions. Both games were eerily similar and had similar behaviors but played out completely differently due to the sheer creativity of both sides. At the end, one could hardly say that the games were like each other at all in their eventual outcome, even given the core similarities. 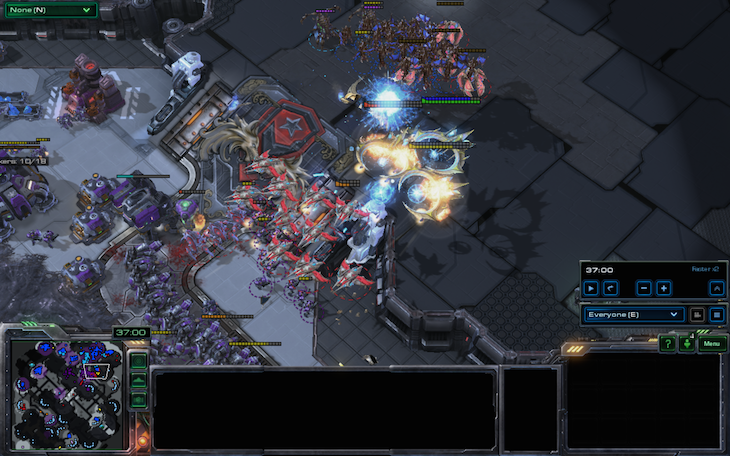 The opposing protoss opens up with the feared nexus first into gateway into double gas into another gateway. 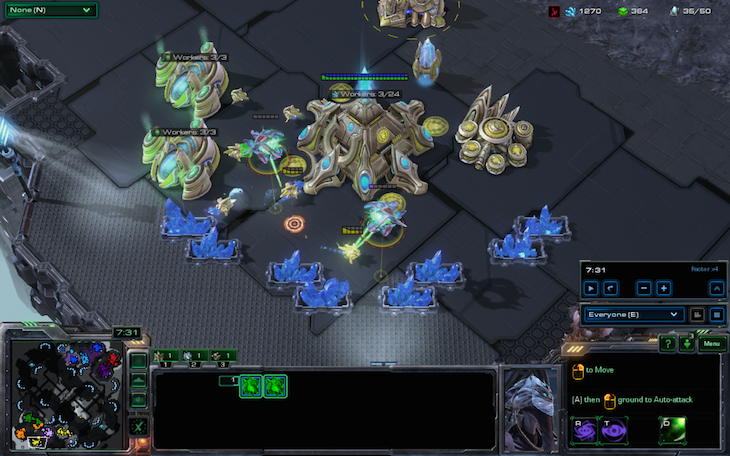 This build has been hidden at the pro level for months, as its use outside of PvP would cause extreme protoss nerfs. 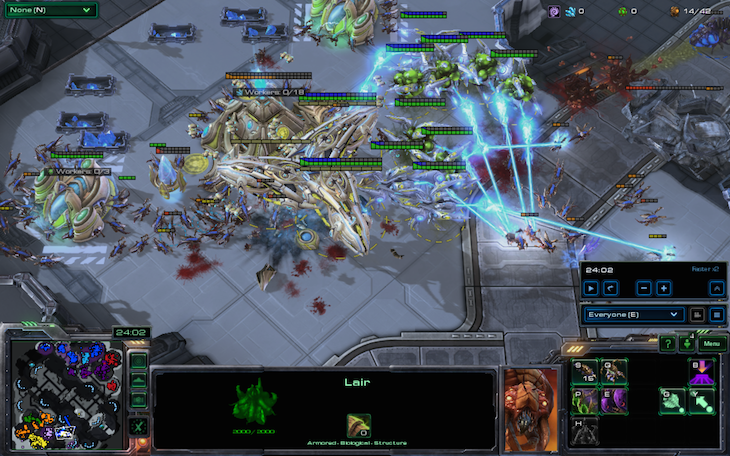 Vetharest attempted to build oracles off of one base to kill workers as quickly as possible. In fact, doing so in 4v4s, with as many as four or five oracles, has seemed to be rather effective. Since you can ignore light static detection to kill as many as 15-20 workers from one player and still come back home to help defend against an attack light on anti-air, it is actually not a terrible strategy. 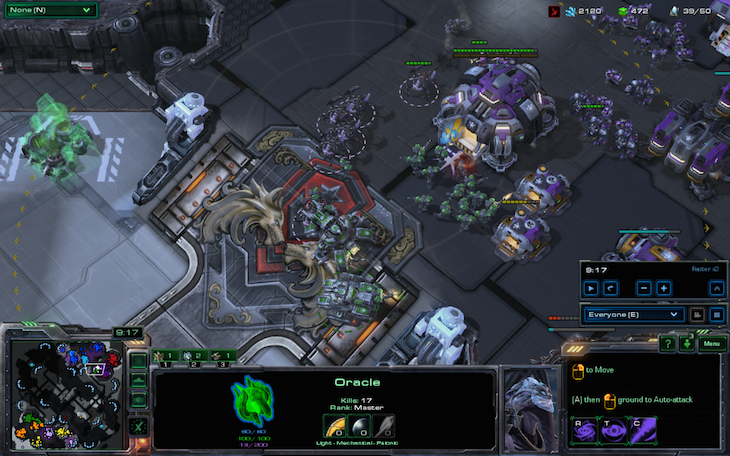 In fact, one of these oracles gets a whooping 17 kills, making him the Master Oracle. There's probably a reference or something here that I'm not cool enough to use. 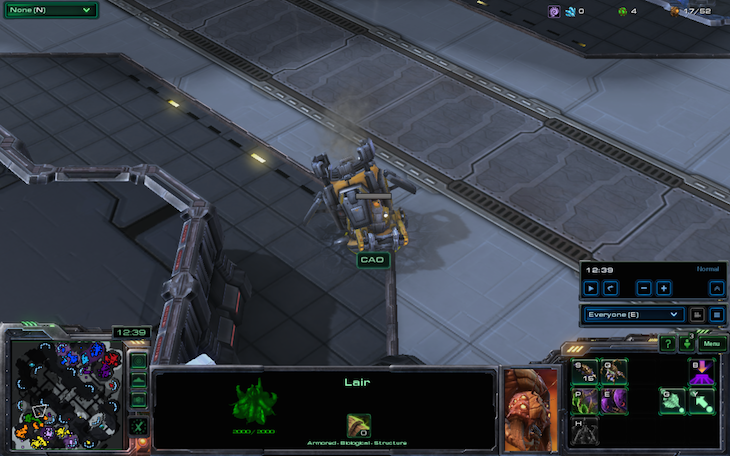 However, a scary tank/marine/roach push from two of the opposing players was formidable enough to make Dog say "Oh, I'm dead" before he even lost any units. This could have been true if it wasn't for the fact he wasn't playing a 1v2. ...surrounds the army, and completely destroys it. 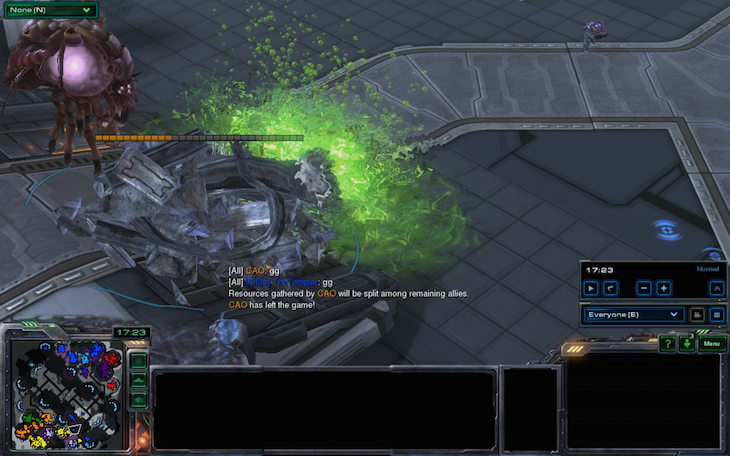 Surprisingly, this was enough to make green outright leave the game, which made me very sad. 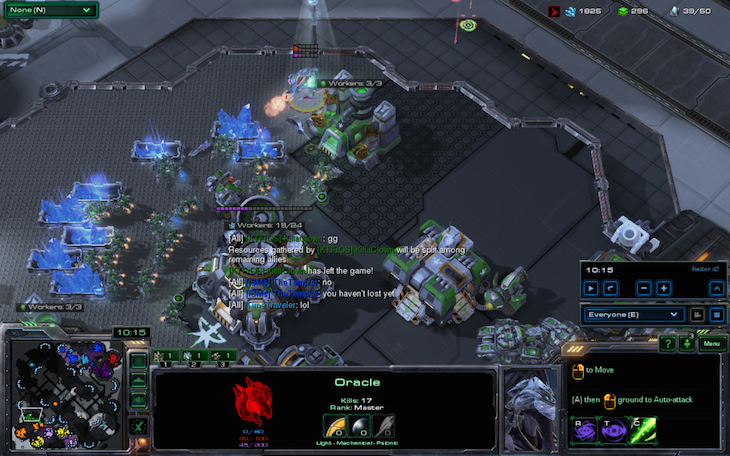 Meanwhile, the master oracle and the other oracle died to a single turret due to Vetharest realizing how much money he had been floating while microing. 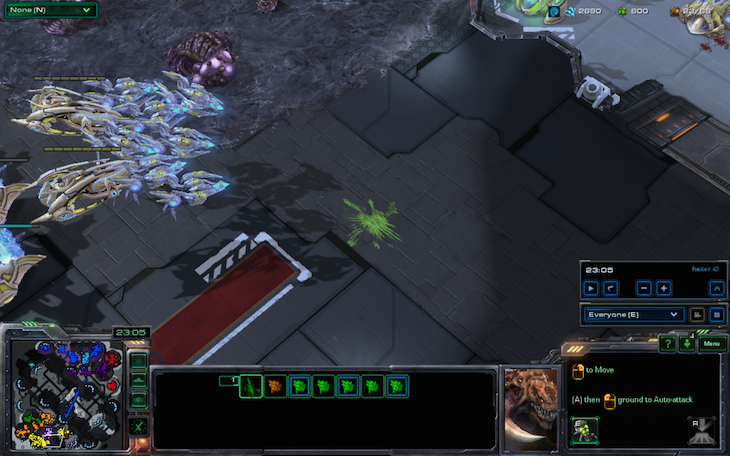 About a minute later, after doing absolutely nothing except floating more and more money off 13 drones and two bases, pink leaves the game. This makes him more useful to his allies, oddly enough. 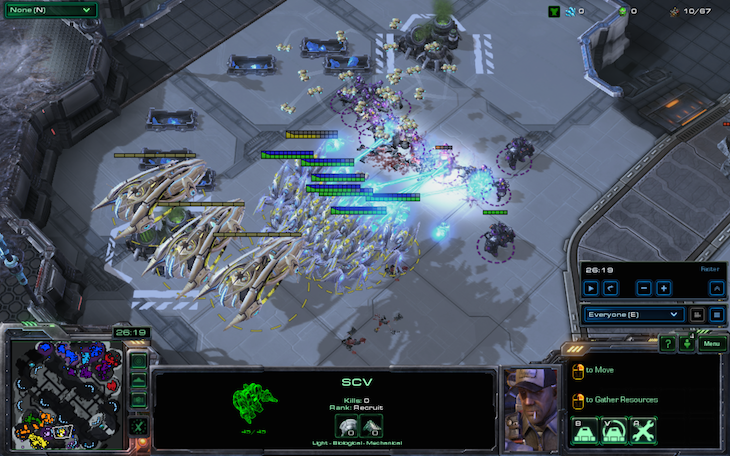 The 6 roach rush accompanying his ally's tanks and marines had been largely ineffective due to poor micro, and he had previously lost quite a few drones to Vetharest's oracles. 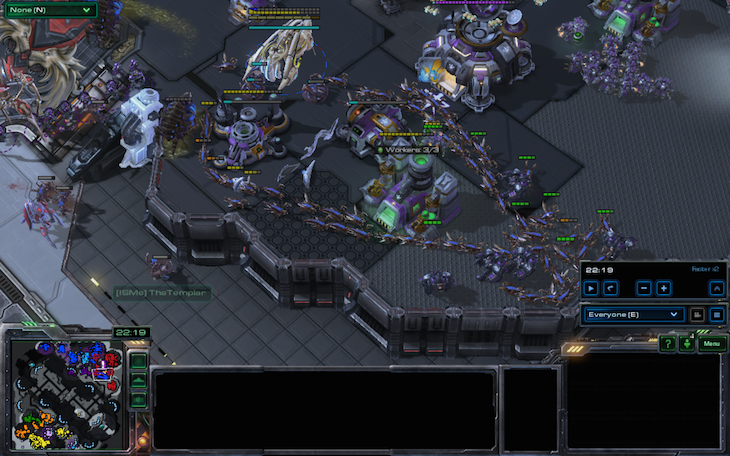 Dog and TimeTraveler teamed up to attack orange's marines, but all of TimeTraveler's banelings died very quickly, killing just two marines, and Dog had an insufficient army. This led orange to drop a manner MULE. Meanwhile, the fourth player was doing the most evil thing you could possibly imagine that had nothing to do with infestors or brood lords. 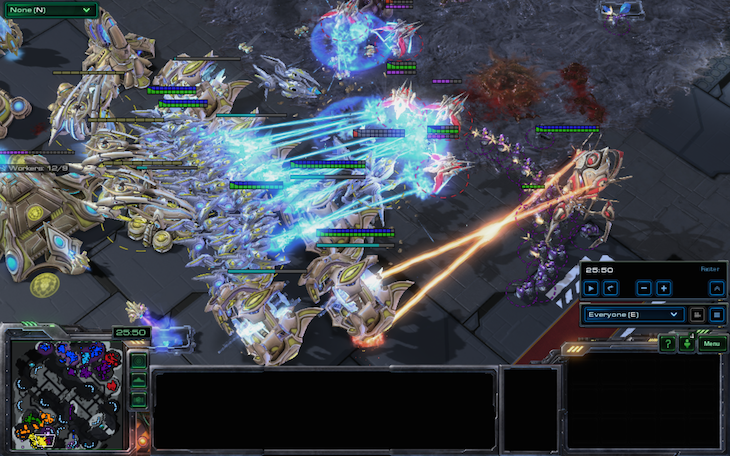 He was literally summoning the master of protoss air, the great commander of all Protoss and of war ships, the one and only sOs. Actually, never mind. sOs would make carriers. My mutalisks, despite being controlled by a person that only knows how to control mutalisks, fly over a pack of marines. Several die. 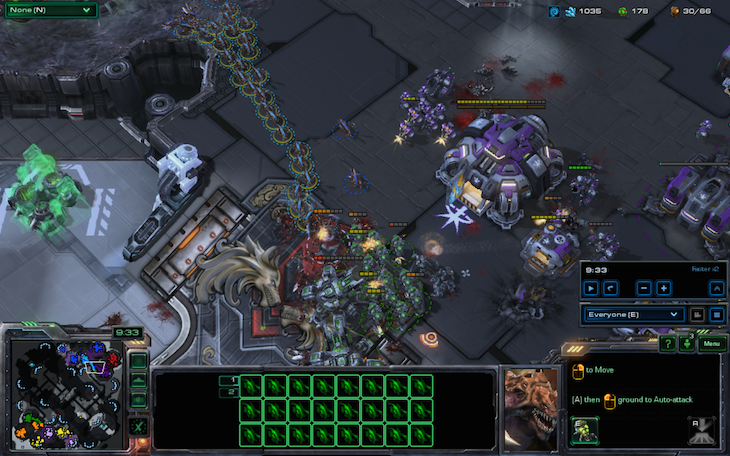 However, this spots the terrans' armies, and Dog and I clean up rather easily. 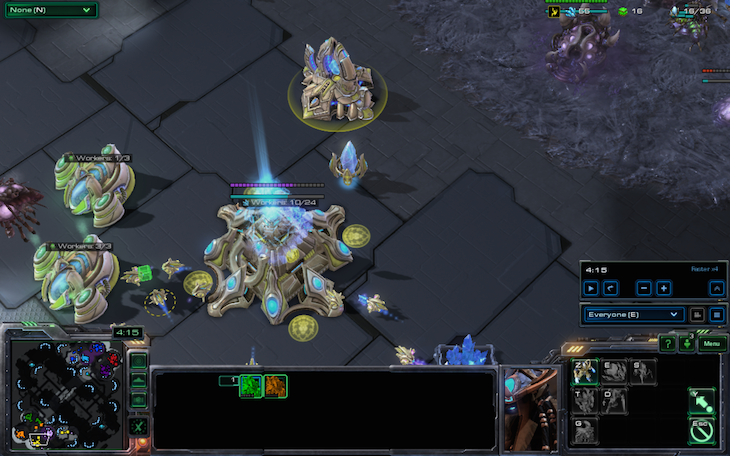 Meanwhile, mutalisks continue their random-looking journey across the map, where they find a command center completely isolated. I looked up CAO and it apparently means a ton of different things. Clearly orange is a very deep thinker. However, we severely underestimated the last player. 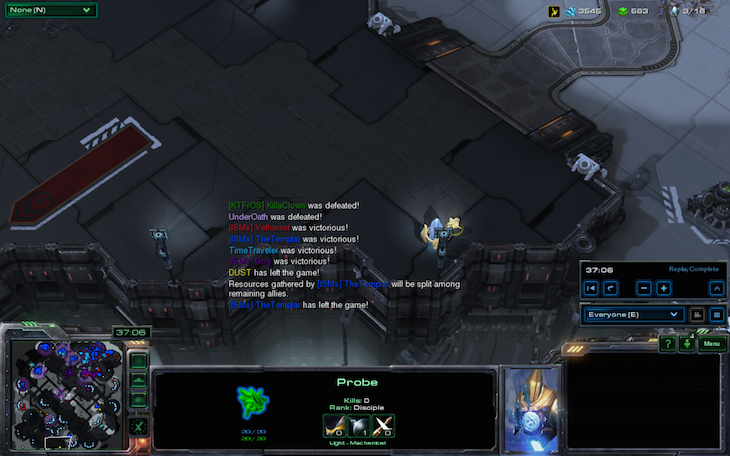 He was the last bastion of hope, the final protoss. 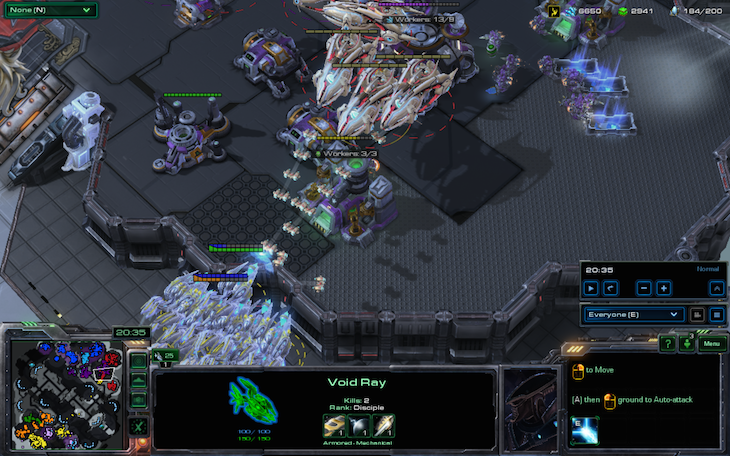 He embodied the entire spirit of 4v4s (Because mass void rays). Given that we are less than 1/3 of the way through this battle report, you just know he's going to put up a fight. Suddenly, TimeTraveler, who is on one base 20 minutes into the game, unleashes his master plan to kill off one of the players who already left. 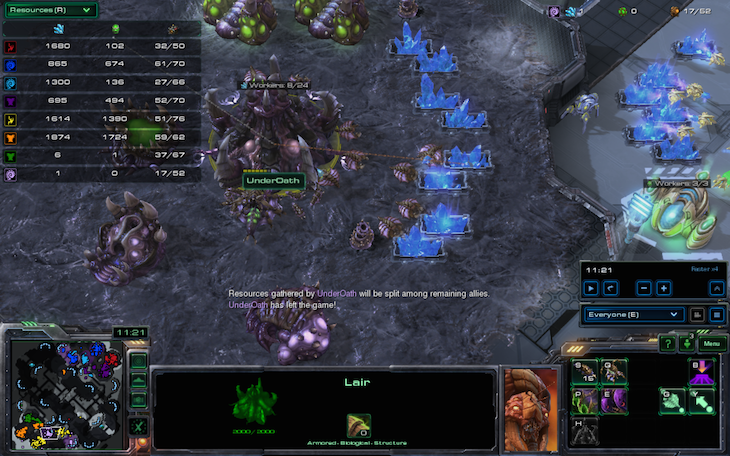 Clearly, by using banelings to kill hatcheries, he will slow down the potential economy of the last player? Either way, it's certainly better than using them on the rocks. Also check out his supply and minerals/gas. The yellow player was occupied with trying to defeat four players at once. Could he do it? Vetharest already had five carriers and Dog and I actually know how to play the game... sort of at least. However, since void rays are incredibly good at killing massive armored units, they roll over the carriers. 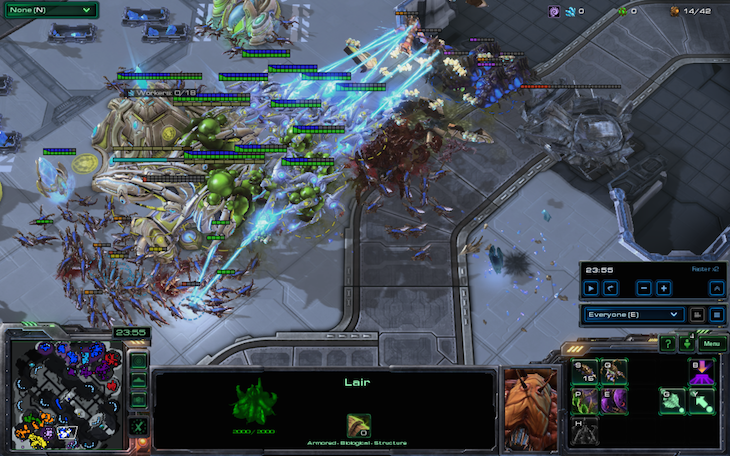 Quick, flood in zerglings! That'll distract them. 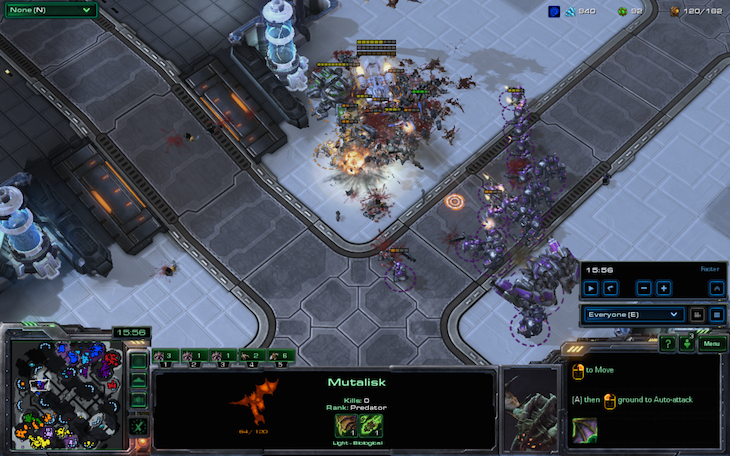 Mutalisks and thors show up, but these alone will not be enough to kill the great protoss fleet of death. Then the infestors show up. 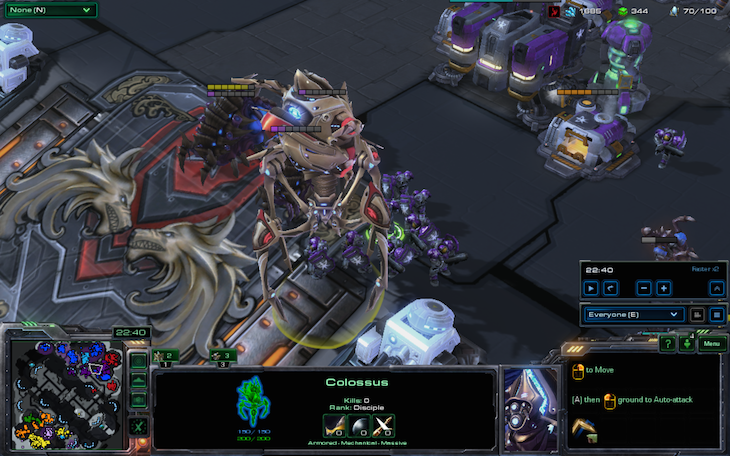 In the chaos, Vetharest made a colossus. Very good composition coming out of him. Now, you would think that the last battle might win the game for us outright. 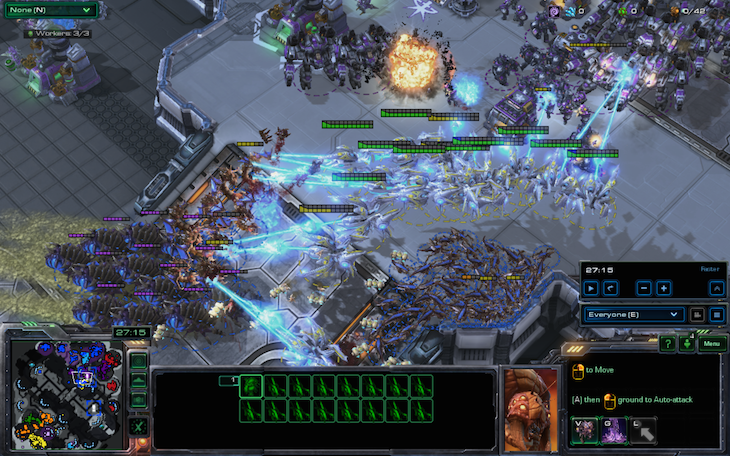 However, protoss units rarely die so easily, and there was already a sizable fleet being made at home. 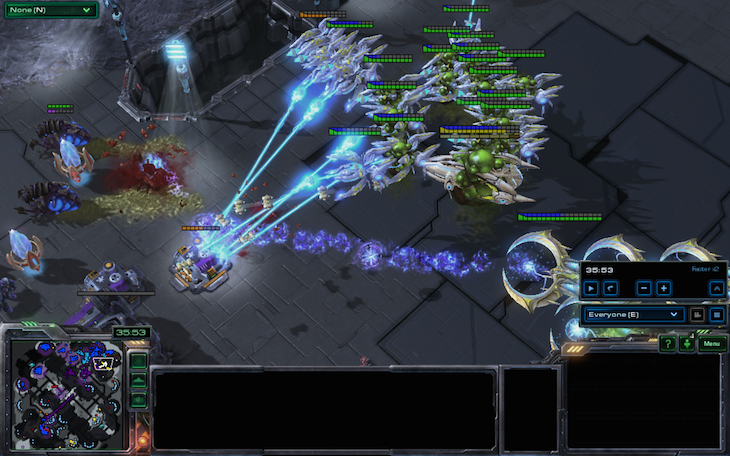 Vetharest anticipated a glorious victory with his three phoenixes. Boy, was he wrong. 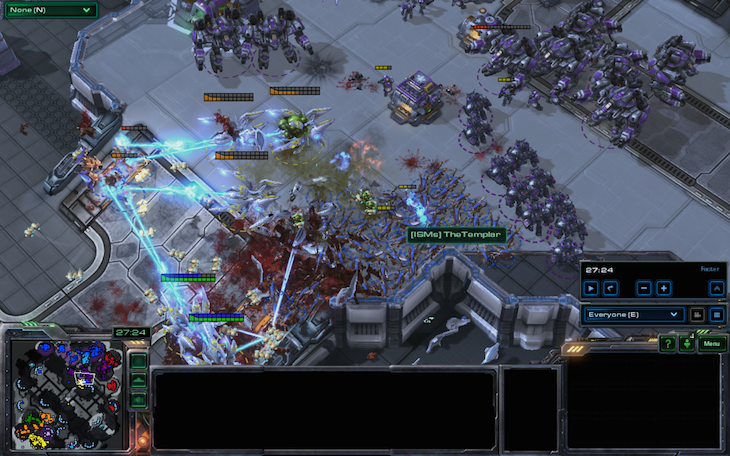 I make the executive decision to flood the bases with zerglings, even though zerglings can't kill void rays. However, it was far too late. The void rays had already reached critical mass and the bank was already ridiculously high, and with that came a massive nuclear laser war of immediate death. 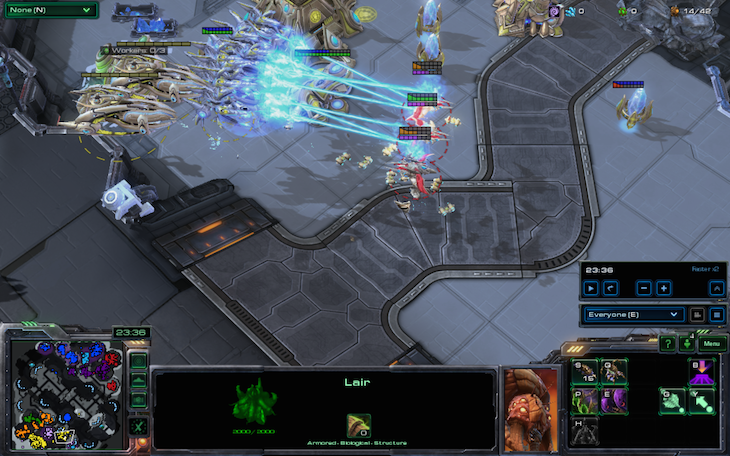 Even the colossus contributes to laser pollution. Suddenly, I looked at Dog. 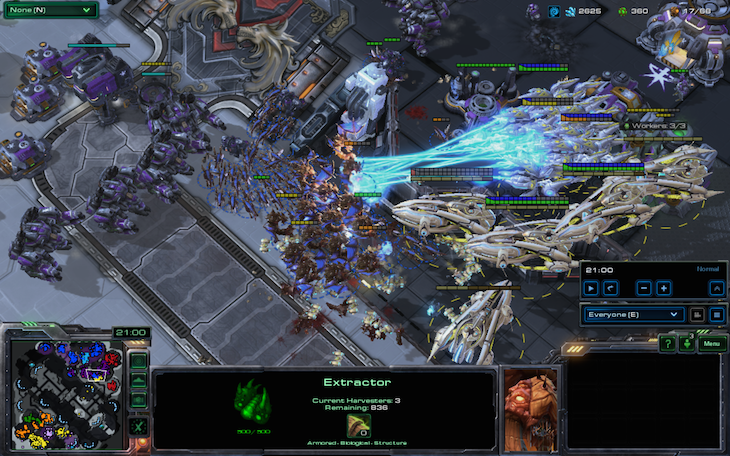 "Back off, he's going to kill your marines with void rays." "I'm not worried about that. I have a lot of marines." 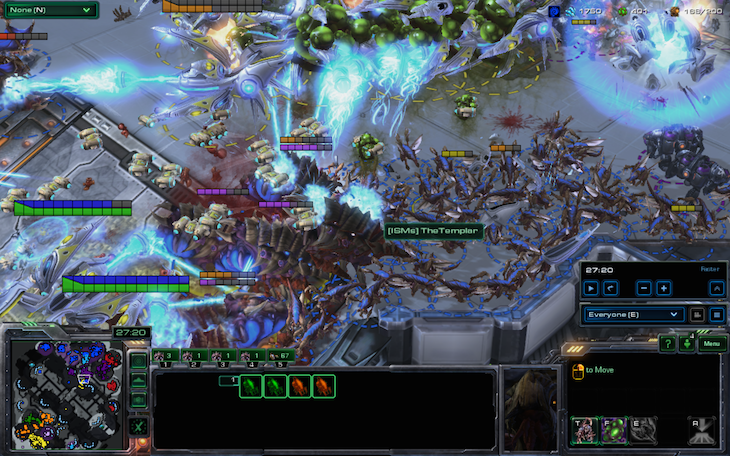 However, he managed to have equal numbers of thors and marines, so the next battle at our base went extremely well. Even then, we managed to clean up. Dog really had a ridiculous number of thors. 4. 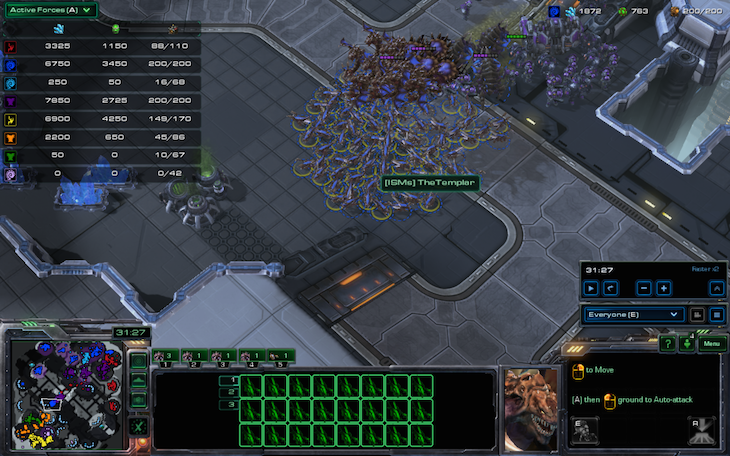 Zerglings still don't shoot up. 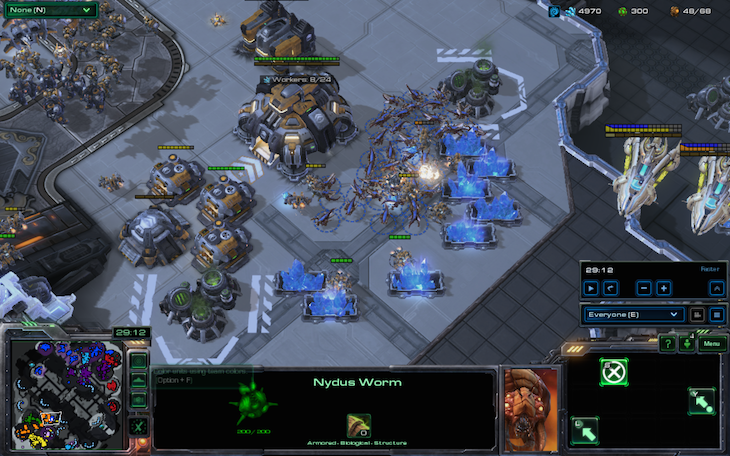 Therefore, as soon as the nydus finished and zerglings streamed out, TimeTraveler immediately started loading zerglings back into the nydus worm. Brilliant tactics! They will never expect this. 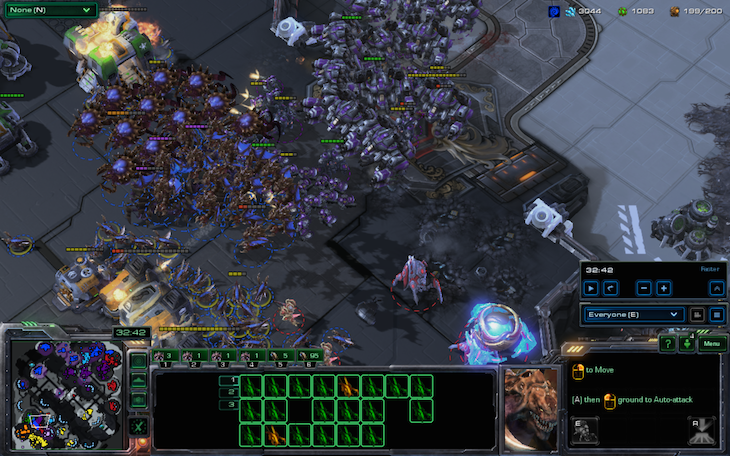 More zerglings deny mining, even though no gas is being mined here. Now, yellow had made a few attempts to use his surrendered allies' buildings and units, but not many, and he forgot something very important. 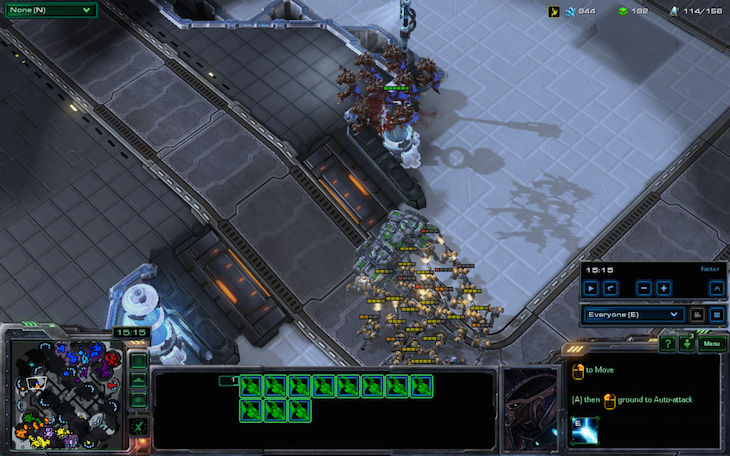 Now, can two maxed armies and a few phoenixes kill a 150 supply protoss army?! We are all awful at coordinating and microing so probably not. 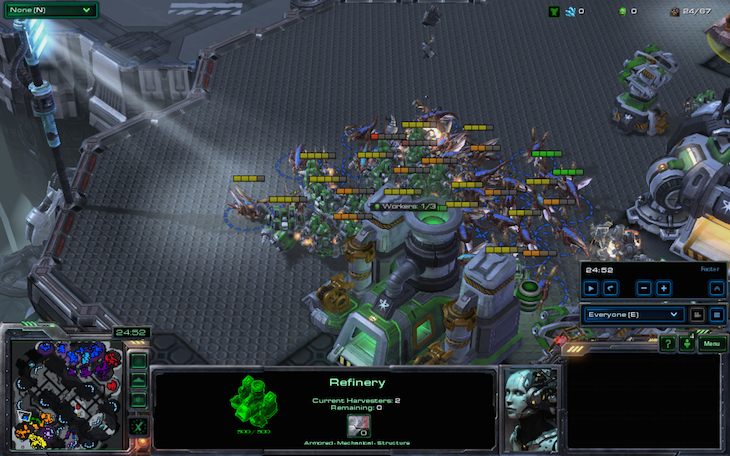 We easily cleaned up the army that had sat at CAO's natural for about 15 minutes and marked on into the main base. 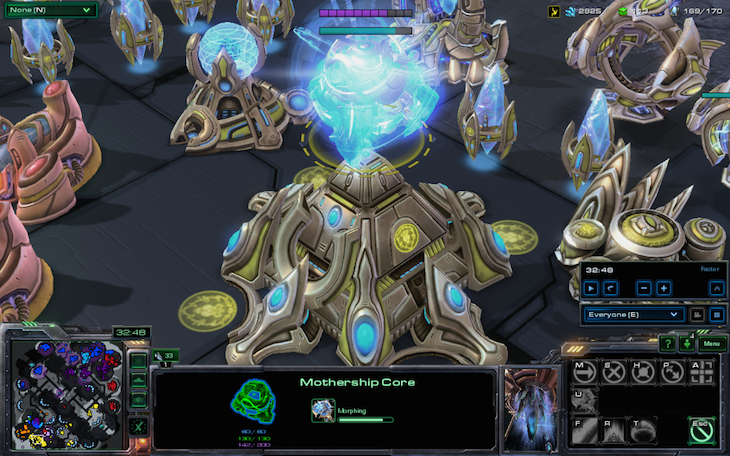 However, because we are all bad at starcraft, we forgot that motherships exist and therefore made no detection. 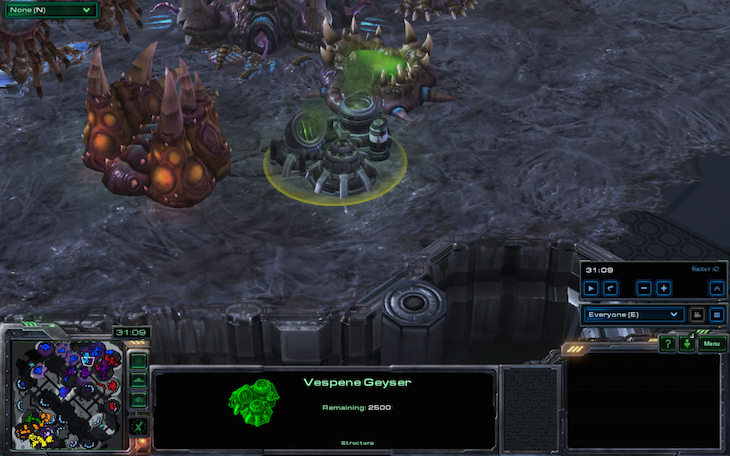 Yellow decided that it was hopeless to defend, and opted for the base trade. I immediately called for my allies to ignore the last base (belonging to pink), which was pointless anyway, and return home with all of the anti-air. You'll never guess what they did. "Don't kill pink! Come back to the base" now means "Kill pink but don't come back to the base". Needless to say, I was confused when I returned to my base and my allies were still in pink's old main base. Damn it pink, you fooled us all. With your cunning "wait one minute and do nothing before leaving" strategy, you enticed my allies to do the same 25 minutes later. Hopefully they don't actually leave though. Chain fungals are ineffective at killing an army when there's no supporting units. Dog's units finally start streaming back towards the main base. Vetharest calls this a "conga line". ...unless you bunch them up against the splash damage effect. All of those void ray ship parts decorate the ramp very nicely. The army is therefore easily cleaned up, and DUST, the yellow player, finally crumbles and leaves, despite still having a pylon. Why does Vetharest have four warp prisms? 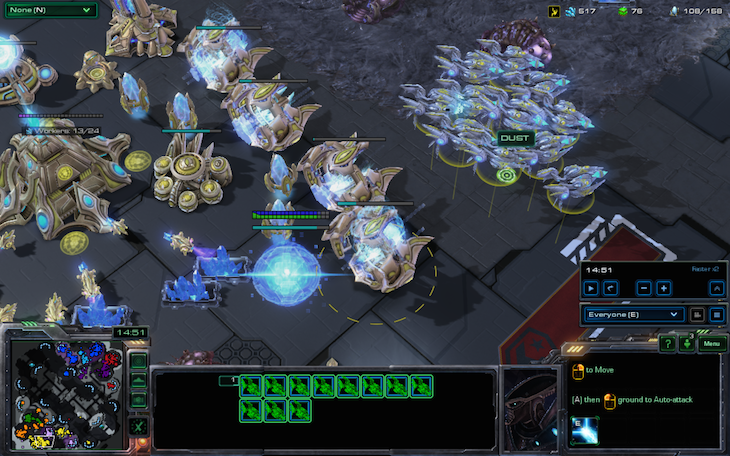 If TimeTraveler was playing as yellow, he would have tried to take one of the bases on the right-hand side of the map around now. 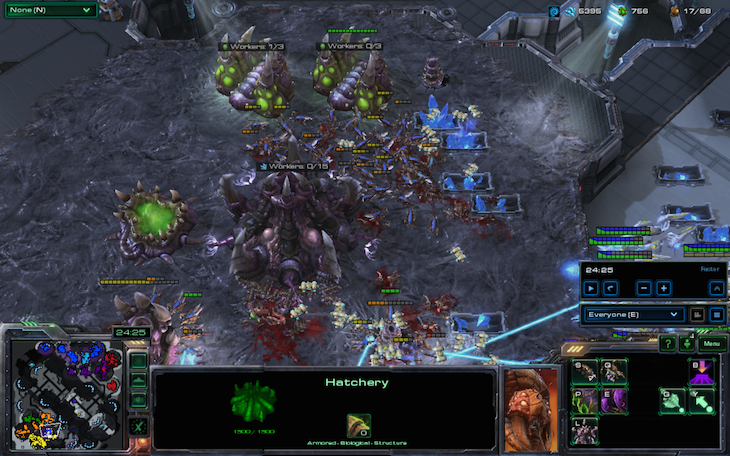 However, since he was teal, he built hatcheries at my expansion instead. 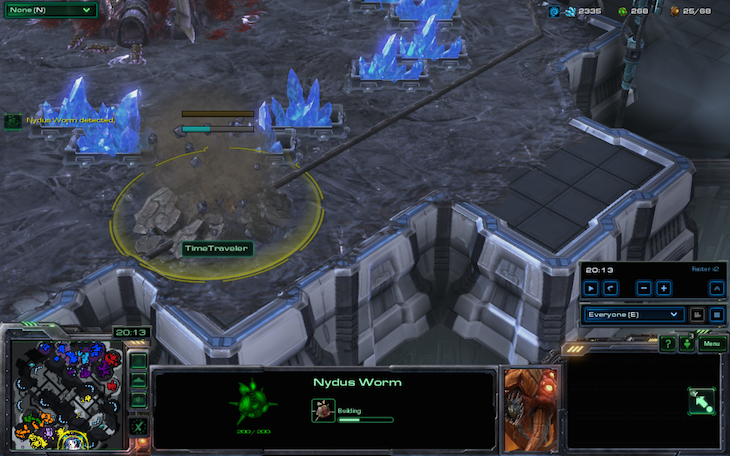 the zerg race really seems to perfectly suit timetraveler's playstyle! by the way, what league are you since you are carrying all four of them?